On Wednesday’s news that Honda of North America will offer a special edition Ridgeline light truck in 2014, it may be noted that although the Ridgeline has won several design and safety awards, including the coveted Car And Driver “truck of the year” award in 2006; its first model year, the truck has never gained an economically viable foothold in a very crowded U.S. light truck market. Selling fewer than 20,000 units in the first 10 months of 2013, Ridgeline is not a manufacturing mainstay for Honda, creator of the best selling small car in North America;the Honda Civic, and other technological innovations such as the 2015 FCEV concept car. Introduced in North America as a 2006 model in 2005, the Honda truck missed the wave of of up-sized Japanese brand manufactured light trucks, as Toyota and Nissan dominated the import midsize market in the United States and Canada. But then again, Toyota doesn't offer a light truck with an internal trunk. 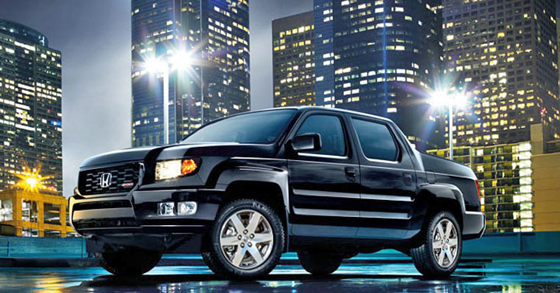 While I find the body design of the Ridgeline to be attractive, to many, it appears to be a ¾ scale replica of the G.M. Avalanche. Don’t get me wrong, I’ve driven both, and find the Honda Ridgeline to be superior to the Avalanche in country road and dirt ( off-road) handling. While I may be comparing apples to oranges, the special edition Ridgeline can be driven off the lot for under $40,000. The Avalanche Black Diamond LTZ, closer to $60K. By any measure the American manufactured, Acura MDX platformed uni-body Ridgeline is worth consideration when contemplating the purchase of a mid-sized truck. Equipped with the 250 hp. 3.5 liter, 24 valve V6 and 5 speed automatic transmission, the Ridgeline is rated at a combined estimated MPG of 21. Not bad for a vehicle that has a load capacity of 1100 Lbs and a standard towing capacity of 5,000 lbs. Add Honda’s patented VT-M 4-wheel drive system to the characteristics of uni-body safety cage construction mounted on 4 wheel independent construction, you end up with a superior quality product with great passenger comfort, handling, stability and utility. For Honda fans, no need to shed a tear as the Ridgeline fades into the sunset. After a redesign in 2015, Honda promises to return an updated version of the Honda car-truck in model year 2016.